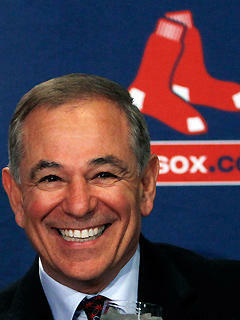 New Boston manager Bobby Valentine. To ask the trendy question from the 1960s: Why is this man laughing? After spending $515 million on free agents over the past five years, and having third place to show for it in 2011, the Boston Red Sox have shelled out only $7.5 million in signings this off season. The franchise has thus cut their opening-day 2012 payroll in a futile attempt to stay below “the Mendoza Line” of luxury-tax penalties—but at least they are economizing. This entry was posted in Baseball and tagged Bobby Valentine, Boston Red Sox, Mario Mendoza. Bookmark the permalink.